In what seems nothing more than a blur, your wedding day passes by in the blink of an eye. You’ve been conversing with long-time relatives and new family members, catching up with old college friends, and dancing the night away as the DJ plays the Cupid Shuffle for the third time in a row. You realize that you haven’t even had much of a chance to talk to your brand new spouse because things have been so hectic. This is a classic wedding dynamic. 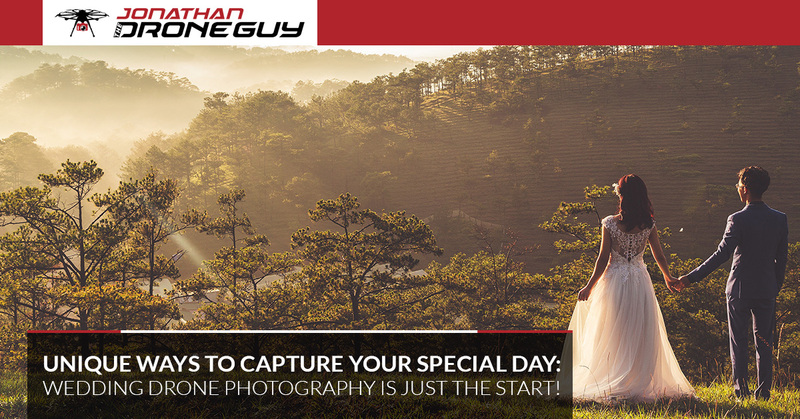 It pays to capture what’s arguably the single most significant event of you and your partner’s lives with something like our drone wedding photography services provided by our in-house expert drone pilot, Jonathan the Drone Guy. If you’re in the greater Los Angeles area and you’re thinking about having an outdoor ceremony, there really is no better way to capture the magic of the moment. As you plan for how to best capture your wedding, here are a few charming ideas to engage your guests and create lasting memories that will last a lifetime. Not only are both of these camera options cheap, but they’re fun for your guests and very easy to use — it doesn’t take a professional wedding photographer to capture silly moments before and after the ceremony. If anything, these simple and raw photos are great because they really capture the natural feeling of the moment. The best part? You’ll go through the developed pictures and sift through the aftermath, getting some fun surprise photos. Wedding guests usually check-in and sign their names on a registry-type book, but think about what’s going to happen to that book: it’s probably going to sit on a shelf and collect dust. By having your wedding guests each sign and write a small but personalize message around a picture of the two of you, you can hang it and display your friends’ and families’ support by hanging it up. How wholesome is that? Though you might get some fixed and even brutally honest advice about this life-long commitment you’re about to make, at least you’re shaking things up from the standard pleasantries exchanged via your register. From the perspective of your guests, they’ll probably appreciate the advice box because you and your spouse (ideally) will be the only ones reading what’s inside of it. No matter what date you choose, there’s always going to be someone who just can’t make it. Let them in on the wedding day magic with a live stream! You don’t have to live stream the entire reception, but capturing the ceremony via drone wedding video will help everyone feel included in the experience. From drone wedding video to drone wedding photography in Los Angeles, Jonathan will make sure that your big day goes off without a hitch. Get started here!